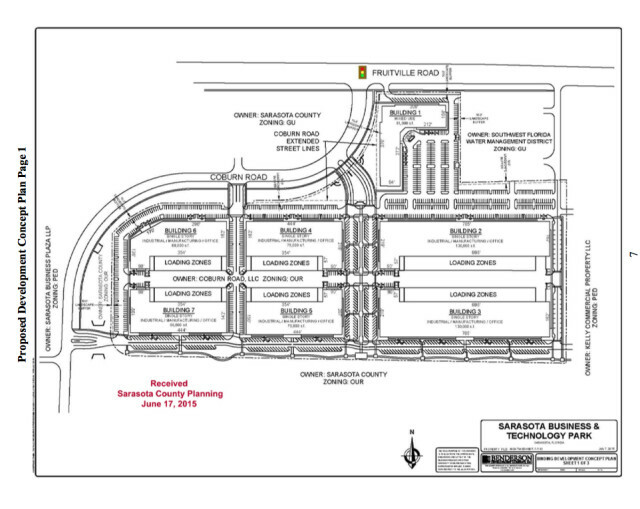 On Oct. 28, 2015, the Sarasota County Commission unanimously denied a rezoning request by Benderson Development Co., so a limited liability company members of the firm had organized could modify its design for a light industrial manufacturing and mixed-use project on almost 42 acres next to the Fruitville Library and the Celery Fields bird-watching preserve in Sarasota. As a result of that board action, the limited liability company — Coburn Road LLC — has won an amendment to its contract with the county to delay any development of the property. The action came on March 8 with a unanimous vote approving the board’s Consent Agenda, which normally encompasses routine business matters, though any commissioner can pull an item for discussion. The amendment calls for Coburn Road to complete the build-out of three of the seven blocks — about 15 acres of the site — on or before March 20, 2019. A March 8 staff memo to the board explains that on Aug. 27, 2014, Benderson entered into a contract for the $3-million purchase of the 41.34 acres in the area known as the Fruitville Initiative, so-called because of community and county efforts to enhance the appearance of the eastern entrance to the county from Interstate 75. 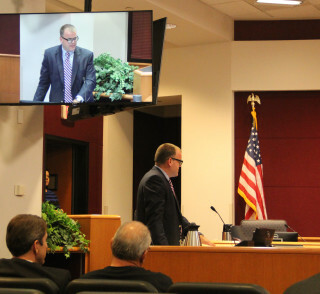 During remarks to the Siesta Key Association on March 5, Maio alluded to that decision, pointing out that the County Commission does not always favor Benderson Development plans. Todd Mathes of Benderson Development explained to the commissioners on Oct. 28, 2015 that the company wanted to adjust the street grid so it would contain bigger blocks. Although Mathes maintained that Benderson was not giving up on retail uses for the structures it planned, a number of the buildings would serve as warehouses, he said. A number of residents protested, referring to the Fruitville Initiative’s goal of creating an area with mixed uses that would be safe and walkable for the neighborhoods surrounding the Fruitville Library. The March 8 staff memo to the County Commission — delivered in advance of the vote — explains that on March 3, 2015, “Benderson assigned all right, title and interest it held in the contract” for the property to Coburn Road LLC. According to the Florida Division of Corporations, that company’s manager is David H. Baldauf, who lists his address as 7978 Cooper Creek Blvd. in University Park. On LinkedIn, he is identified as the general counsel of Benderson Development. The other manager of the limited liability company is Shaun Benderson, vice president of Benderson Development. 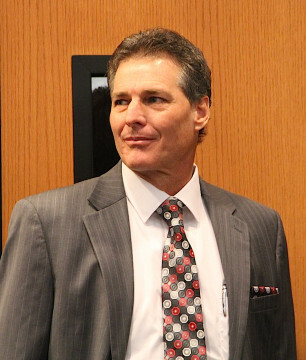 Coburn Road submitted its articles of organization to the state on March 2, 2015. On March 20, 2015, Coburn Road and the county closed on the contract, the staff memo adds. One of the provisions required the commencement of construction of 200,000 square feet of light industrial and supporting development by March 19, 2016, the memo points out. 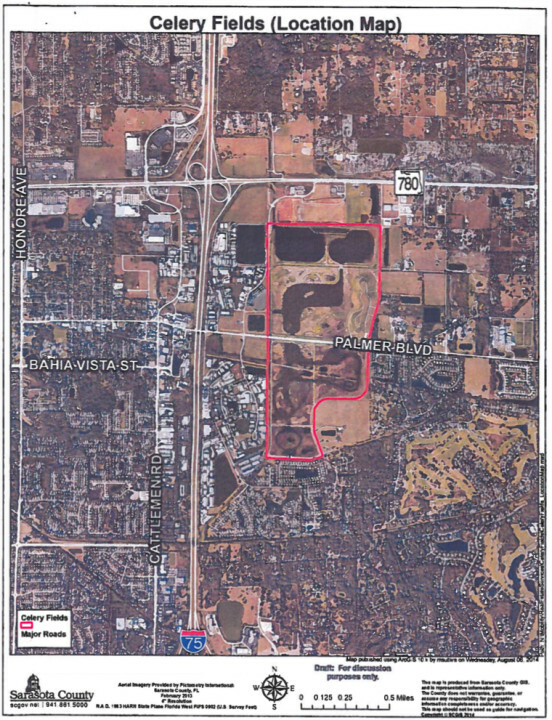 The March 8 board vote amended the starting date of construction on 15 of the approximately 42 acres to Sept. 20, 2017, with the completion date no later than March 20, 2019, according to backup agenda material. The contract amendment also says that Coburn Road and the county recognize that Coburn may develop 300 multi-family units; 400,000 square feet of office space; 57,500 square feet of mixed-use retail space; 8,500 square feet of standalone retail space; and 50,000 square feet of industrial space on the site. Further, the construction of a linear park must start no later than Sept. 20 of this year and be completed by Sept. 20, 2017, at which time the company will convey a permanent park easement to the county, the memo adds. A linear park enabling easy access for users of the Celery Fields was part of the initial discussions between the commission and Benderson Development staff. Another contract revision the board approved on March 8 calls for construction of cross access points, roads and public parking to be undertaken in phases, with the first to consist of the north/south Main Street in the development, a connection to Coburn Road and limited parking along that Main Street. That is to commence on Sept. 20 of this year and be completed by Sept. 20, 2017, the memo says.